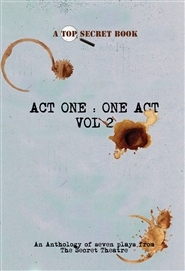 In our continuing series of anthologies, we are proud to present 7 plays from The Secret Theatre's Act One: One Act Festival. This selection reflects the amazing variety of new work present by emerging and unsung playwrights. We hope you will enjoy these plays and perhaps may consider producing or directing one of them yourself. Featured playwrights include Will Hart, Pete Holmberg, Mark Lord, Stephen Bracco, Amanda Terman, Rollin Jewett, and Kyle Smith.